We’ve said it before and we’ll say it again – over 90% of consumers use the internet as their primary means to investigate a business. That means if they’re looking for a Real Estate agent – they’re taking to Google to go do it. One of the newest tools they’ve begun to use to conduct those investigations are Google Reviews. The research suggests that 30 to 40 percent of searches are local and that 72 percent of readers trust online reviews as much as the ones they read in print. As such, encouraging and accumulating strong reviews should be a priority for any local business. Not only do they help you in search rankings, but more often than not – can be the difference between getting someone’s business or watching it land in your competitor’s lap. Today, we’ll help you learn how to set the stage for compelling your customers to not only write reviews for you – but write the kinds of reviews that get you more business. Don’t be afraid to ask for reviews – Everyone remembers feedback cards from the good ole’ days, and today – there’s still something to be said for them. Imagine Google reviews are just that. Ask and encourage your customers and clients to write a review for you online. Doing so helps you gain better insight into your businesses’ strengths and weaknesses while making sure your customer base feels engaged and valued. Don’t be terrified of negative reviews – The hardest thing for people to let go of is the fact that they know that some of the reviews won’t be kind. 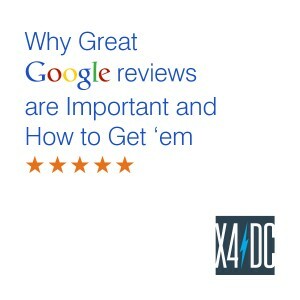 While you want to make sure your reviews are as positive as possible, don’t discard the bad stuff. In fact, you should embrace it. Negative feedback can help you identify areas of your business that may need improvement and areas of your service that need to be upgraded. Think of them as opportunities, not detractors. Promote reviews to your customers – Whether it’s a table top rack card or something directing them to your site on their receipt, be sure to tell your customers to write reviews and make sure it’s as easy to do as possible. We even recommend a piece that explains WHY their feedback is important to you. Give them a reason, give them some incentive and more often than not, you’ll achieve your desired outcome. Keywords – Whenever you ask for a review, be sure to tell the customer to mention the product or service they purchased. Why? Because Google is actually aggregating those results and it can help boost your search rankings. Don’t literally give them keywords, just ask them to mention your service. This is important because if Google sees a review that’s artificially crammed with keywords, they’ll penalize you. Make sure it’s as organic as possible. Thank people – Whenever someone leaves a review about your business – whether it’s good or bad – be sure to THANK them. It goes a long ways towards encouraging people in the future to review your business and shows customers that they’re valued and appreciated. Especially on negative reviews – you have a chance to CORRECT something and even do it in a quasi-public way. Just your taking the time to fix a problem can turn someone who’s angry or frustrated into a lifetime customer. It also speaks volumes to people when someone’s willing to fix something instead of letting it fester.